Marie-Dolma Chophel is an artist living and working in New York and Paris. 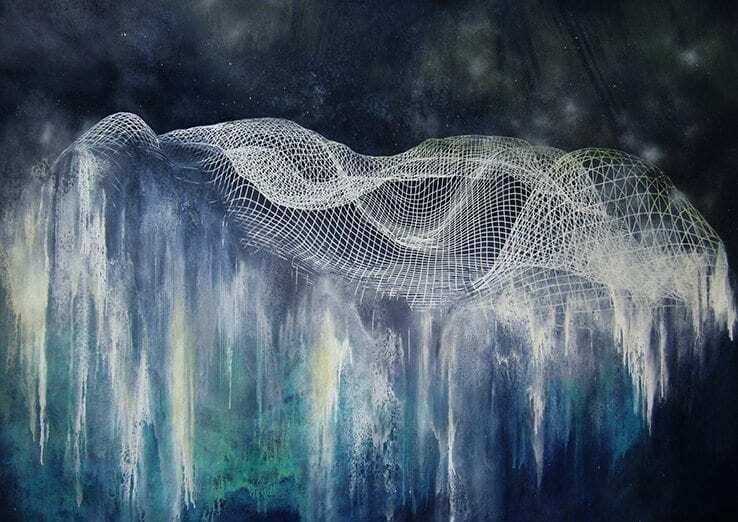 Chophel uses a blend of painting and technology to create powerful and organic dreamscapes. Her unique technicolor-atmospherics have been exhibited nationally and internationally including at the Queens Museum in New York. In this interview, Chophel opens up about her creative process, artistic inspirations and lifts the curtain on her forthcoming exhibition at the Berkeley Museum. RW: Tell us how you first got your start in painting. Marie-Dolma Chophel: I have been drawing and painting as far as I can remember, being pretty contemplative and solitary as a kid. Later on, I took an intensive art option in high school, knowing that I wanted to move in that direction. That led me to submit to art schools and enter the fine arts school Ecole Nationale Supérieure des Beaux-arts de Paris, where I graduated with BFA and MFA degrees. RW: Is your family artistic? Did you grow up around the arts? Marie-Dolma Chophel: No one in my family was in the arts, but my mother has always been a free spirit and an art lover. She had a couple of close friends who were professional painters or musicians and they would often take me to art shows and concerts. It has left a strong impression on me. She always encouraged me to follow my own path. “Metamorphosis” (2017) was created using oil, enamel, spray paint and paint marker. Courtesy of the artist. RW: Do you think your background informs your work? If so, how? Marie-Dolma Chophel: I think any work of art is informed by background in a sense, at least in its genesis. I believe any artist creates their own language articulated through the prism of their memories, experiences, emotions and thoughts; seeking a way to make sense of it, to engage a dialogue with the outside world. It takes a lot of work and perseverance to find your own voice. At first was the instinct, the impulse of painting. As a student, I started to paint a lot of mountains before even thinking of why I was painting them. It took me a while to understand it was not only a subject to paint but a way to explore and question a part of my identity. I was born and raised in France from French and Tibetan parents. My father had escaped from Tibet as a child, and the feeling of dislocation as well as the experience of a denied culture and land are part of my heritage. Identity is an unfixed network though, composed of a multitude of elements which expand and contract, it is a breathing structure connected with history and collective memory. RW: What else inspires your current (or past) work? Marie-Dolma Chophel: Although a total neophyte in sciences, I’ve always had an attraction for biology, chemistry and astronomy. From the contemplation of nature and a naive fascination for what makes things the way they are and how they change, I’ve followed my intuitions in order to create imaginary spaces where chaos and order, constraint and emancipation, can coexist in a common space. For the past six years, I have also nourished a strong interest in new technologies and their impact on our perception of the world. Technologies provide us an immediate access to an infinite number of information and images in a few clicks, as well as new ways to connect with others, while we can inspect every corner of the planet and beyond from behind a screen. Technological tools add new and ever-evolving features which create an endless number of worlds, where the limit between fiction and reality gets blurred. Painting appears to me as a way to give back time to space within the frame/screen of the canvas, and impede the seemingly constant acceleration of time. It is a terrain of resistance. An ongoing concern in my practice is the exploration of how to push my exploration of colors, textures and shapes in order to highlight a sense of always-in-flux territories, the expression of natural forces, impermanence, as well as an emotional impact. RW: Do you find yourself returning to the same themes or branching out? Marie-Dolma Chophel: When looking at my work over the past ten years, I see a coherence that I could not have anticipated. Step by step, I got more precise, my intentions became clearer. 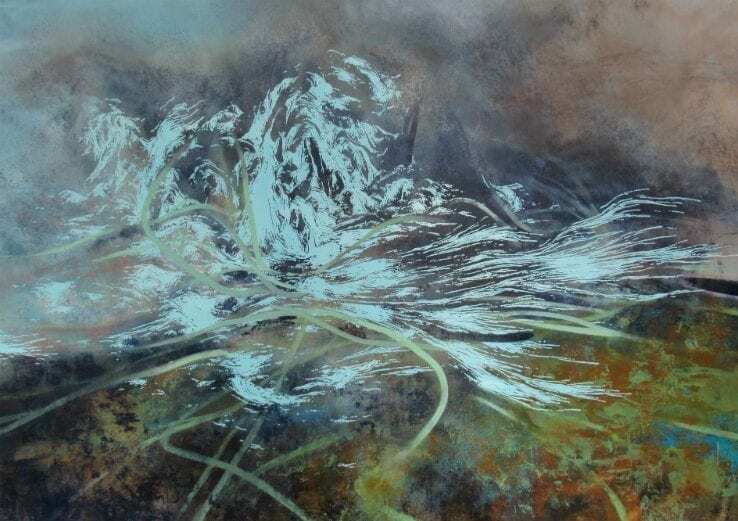 A lot of themes are recurrent in my work as there are infinite ways of painting them, almost like a mantra to refine… mountains, vines, clouds; it is not really about the subject in the end but the energy. We use the same words all our life and we don’t get bored of putting them together, they resonate in a unique way depending of how we articulate them with others or to whom we address them. For now, the impulsion to create new works, the failures on the way, any new success in experimentation, are pushing me to continue. 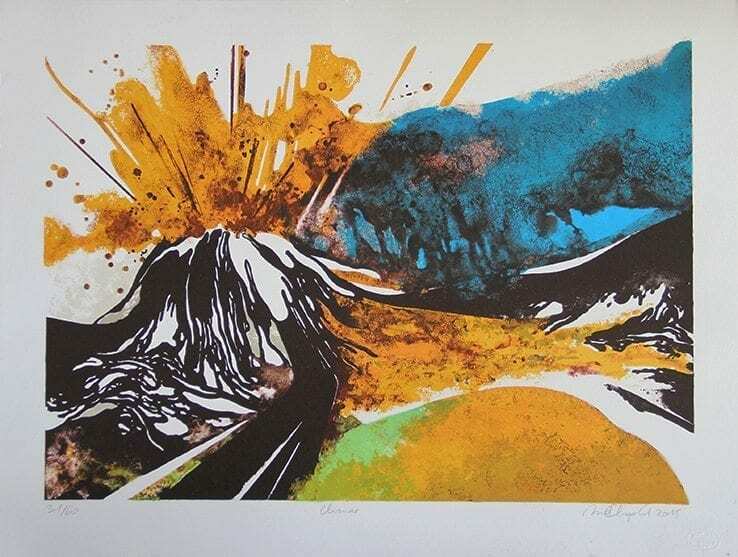 Through her gallery in Paris, Chophel offers limited edition prints, like “Climax” (2015), pictured here. Courtesy of the artist. RW: Which piece of your own work is most special to you and why? Marie-Dolma Chophel: It is always the one I have just finished. When reaching that moment where I finally feel that the piece is done, it is the only work that exists, it has to be the best one I have ever made… until the next one. RW: Let’s talk about your creative process. What does your day to day look like while you’re working on a new project? Marie-Dolma Chophel: I never work from preparatory sketches and instead start to work directly on the white canvas. I use brushes, sprays and transfer techniques to create background layers, taming the entire surface to define the context for an imaginary landscape to emerge. From strata of this abstracted space made of transparencies and different textures and colors, contrasting organic shapes and geometric elements will then confront and interact, undergoing mutations. In parallel to the painting process, part of my work is made on computer using a 3D software, where I create 3D topographic meshes which are then projected and drawn by hand on the canvas. Going back and forth between the drawing of lines and painted elements, I play with composition to render a sense of movement and a feeling of expansion within the canvas frame. RW: How do you motivate yourself when you’re in a rut? Marie-Dolma Chophel: I would love to have a recipe, but I don’t. I guess it is truly part of the creative process, although pretty unpleasant to deal with. Sometimes I will stay in the studio and literally stare at my work for hours until I find a way out, or start another piece and set aside the work I had in progress for a while. It can be really hard to let it go, it lays there in a corner of my head. When I feel really drained I generally try to take a break from the studio. You can’t always be in the studio. Finding inspiration is also just about living… being in nature, seeing more shows, spend time with the people I love. “Leeway” (2018) is an acrylic work on canvas. Courtesy of the artist. RW: Which artists do you admire? Marie-Dolma Chophel: The works of artists such as Sigmar Polke, Peter Doig, Julie Mehretu, Gerard Traquandi, Joan Mitchell and Vincent Van Gogh – just to name a few- are great inspiration for me. I see in their works a unique combination of vital energy and poetry. RW: Sadly, my last question: what next can we expect to see from you? Marie-Dolma Chophel: I have been working recently on conceiving installation and video projects in addition to my ongoing painting practice. One video project I am working on will be included in a group show at the Berkeley Museum in September and I am really excited about it. It is still in progress so I can’t talk much about it. These kinds of projects are pretty new to me and I am looking forward to find spaces to make them become real. I believe they will create a great dialogue with my paintings, taking my imaginary spaces out of the canvas frame for a different immersive experience. Great artist and great interview. Thank you. Very knowledgeable and sensitive. Very impressive presentation. Looking fwd to see more interviews.